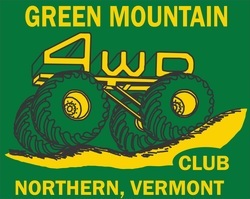 The green mountain club 4 wheel club was founded in 1982 out of friendship and the intrest in four wheeling, by 4x4 trucks and ATV owners. We try to promote four wheeling while enjoying our country's natural resources. We participate in community affairs such as as; parades, charitable fundraising, search and rescues and any other activity that may arise. The club organizes its own events to promote the sport of 4 wheeling. During the spring, summer, and fall we go on trail and mud runs at least once a month. We always clean up the trails that we use. If the trail is long enough and we have enough members, we can plan on a overnight camp out. During the winter months we still remain an active club. We go on runs with our ATV's and snowmobiles. The club holds a monthly meeting at the American Legion in Colchester (VT) on the first Wednesday of every month. Anyone with interest may attend. Annual dues are very reasonable at the rate $50 (you get a sticker). We have a monthly newsletter, discount programs with relevant businesses.